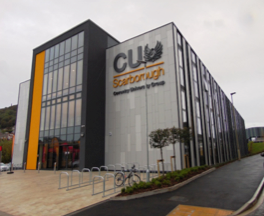 Coventry University Scarborough Campus is a world class university providing higher education for students from 18 years old. The courses provided range from science to business and marketing. The facility has a super lab, debating theatre and first-class IT facilities. EMCE were contracted to carry out the full Mechanical and Electrical installation to the project. A design brief was provided by the consultants with final design down to EMCE. The design was carried out using AutoCad Revit software to BIM level 1. The project was required to meet an overall Energy Performance Rating Assessment rating of ‘B’. This required detailed attention to the mechanical and electrical services installed to the building. To assist in achieving the required EPC rating REHAU under floor heating and LED lighting with smart lighting controls were installed to the building. The emergency lighting is monitored and tested by a Tridonic system. The system schedules the testing of the emergency lighting and sends alerts to the site team of any failures. All mechanical and electrical services to the building were metered and monitored by the central BMS system. The M + E installation was completed in 26 weeks.